Day 9 of 40 days of yoga. It was a summer’s day straight out of the box today. There’s probably thousands of different summers all around the world – but the summers where I live are hot (of course), humid (you better believe it), stormy and wet (usually). It’s been getting hotter by the day this past week, with no relief. Hot days, hot nights and no storm to cool us down at the end of the day. This morning was no different. By 11:30 a.m. it was 38°C and sweltering. The fairy queen and I paid a visit to our local community market, where everyone was drooping with the heat – and it was only 9 o’clock! I bought some potatoes and zucchinis, freshly picked that morning from a friend’s farm down the road, and scored a hammock chair for my verandah for only $10 🙂 In fact, she only charged me $8, but I didn’t think it was enough :). I had plans for those zucchinis too – I’ll tell you later. The fairy queen was as happy as can be playing with the eight 4-week old puppies for sale (no, we are not getting a puppy) and all of her friends who live close by. When we left the market, we hatched a plan – go home, pick up the boys and find a nice spot in the river to lay in like lizards. The river is not in peak condition because we have had such a dry spring, but I was sure I would find a nice, clean, place to cool our bodies. Half an hour later – mission accomplished. Cool river + hot day = bliss to this river-loving girl. Plus – we could already see the thunderheads building up over the horizon. I thought I would do the summer yoga sequence again – the heat hadn’t really broken yet, although one storm had rolled through. The sequence begins with a variation of the moon salutation. Sun Salutations and back bends are considered warming asanas – and to balance out the heat, a focus on forward bends and moon salutations are recommended. To be honest, I had never heard of moon salutations, which are the yin to the sun’s yang, a female counterpart to the masculine sun salutation. This appeals to me, partly because I yearn for balance (libran moon), and partly because I see it as a way of honouring the feminine. Moon salutation. This sequence was put together by a woman called Laura Cornell. If you go to her website, she has a lovely free e book that walks you through it with more detail. I am not sure if it was the heat, or the asana sequence, or the slowness of the practice, but my meditation was so deep at the end of it, that I really struggled to leave it when the kids wanted me – Mum, play games with me! Play the dinosaur game, or what about the a game on the wii? Mum, come and play cricket outside, it’s nice and cool now! Sitting down and doing anything logical seemed just about impossible, so i opted for the cricket game. The second storm was rolling in, the temperature had dropped 15 degrees from the heat of the day. It is one of my favourite images – charcoal skies, green grass, with a backdrop of vivid jacaranda and flame tree. There are worse ways to spend an afternoon, right? the jacaranda and flame tree in our back yard. Salt the zucchini in a colander and leave for 15 minutes to drain. Rinse and squeeze excess liquid out. In a large bowl, combine all ingredients except for the egg whites. 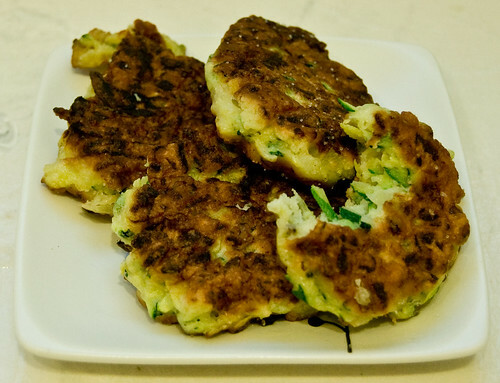 Beat the egg whites until fluffy, and incorporate into the zucchini mix gently. Fry in clarified butter if you have any, or a mixture of butter and olive oil. Serve with yogurt or sour cream, and tuna if you want more protein. That kale recipe looks amazing! It looks like the kind of salad that I love to eat, but never make. I don’t know why, really. i haven’t always liked zucchini, but I sure love it now, and even my carnivorous partner loves them – and my kids 🙂 A winner!